The museum of the Nationality of the Heroic Village of Los Santos : This cultural nucleus is found situated front al park Simón Bolívar, old Main Square of the santeña population [people from Los Santos] and diagonal to the church of Saint Athanasius, national historic monument. With the creation of this museum, it was complied with an old patriotic aspiration of Dr. Reina Torres de Araúz. The oral tradition indicated the noble building where located the museum of the Nationality as the place where met the city hall to declare broken the political ties that united the Spanish empire. This building carried out different rolls through the epochs. It is said that it is, in chronological order, older than the Church of Saint Athanasius. During the war of the Thousand Days it worked like military headquarters of the governmental troops and then a basic school was established there. Its disposition is the following: the main room is located in the central position with regard to the other rooms of the institution. It has two doors built of planks of the epoch; the floor is made of tile of great size. An ambient small living room conducts us to the colonial period; in it is exhibited two chairs of turned wood and embossed leather, a colonial table with spiral legs date from the 18th century, an old wall clock and an oil painting of Ernesto Nicoleau who found a copy of the minutes of the “Grito de La Villa” of Los Santos [Shout of the Village of Los Santos] of November 10 th, 1821. Valuable collections of colonial sacred art introduce to visiting in aspects of the Spiritual conquest of Azuero. A museum in Los Santos. Los Santos has a rich cultural history in Panama. The Azuero Peninsula boasts the friendliest people and best cultural experiences in Panama. The real estate investment has just found out about Los Santos and the Azuero Peninsula. Make sure you take a trip here and discover your own piece of paradise. This it situated in the plaza that has the name of the illustrious statesman in the city of Las Tablas, capital of the province of los Santos. The museum Belisario Porras is located in a rectangular building, ceiling of imperial tiles and walls of blocks covered with cement. In its frontal part a beautiful garden raises itself, encircled by a fence of bricks that crown a metallic iron gate. The facade is characterized for an extensive porch flanked by a group of eight columns that are distributed matched. In the interior of the same one, a central place is emphasized an exaggerate oil painting of the Dr. Porras, life-sized in which carries the presidential band of 1912. In the center of the stay, the mausoleum of granite and green marble that even awaits the remainders of the governor is raised. The museum Belisario Porras opens its doors to the public from Tuesday to Saturday of 8:30 a.m. to 12:00 p.m. and from 2:00 p.m. to 5:00 p.m. Sundays has a schedule from 9:00 a.m. to 12:00 p.m and remains closed on Mondays and holidays. 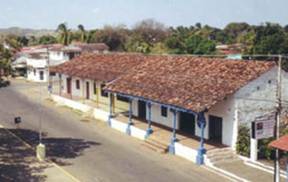 The Historical Project Pausilipo Park began in 1971, when the municipalities that form the Province of Los Santos, contributed to the economical means which was necessary for its acquisition in hands of The Espino Family from Las Tablas, and it was transferred to the National Office of the Historical Heritage, in order to this state institution proceeds with its restoration and to be valued. The old large house of the Pausilipo is of walls of adobe and ceiling covered with grooved zinc. It has rectangular plan and a wide entry, where the pillars of medlar tree are emphasized that support the roof. During the process of restoration, the kitchen was built again, that had collapsed for the action of the time. The large house previous architectural restoration would become a museum dedicated to exalt the work of the Dr. Porras as the statesman. Three typical constructions of the “santeña” region would be integrated to the project, of which one would be destined to permanent dwelling of a rural family of artisans; the other two would function like workshops specialized of smithy and traditional ceramics. A third serious element would be a building with facilities as conference room, library, rest area, etc. that would allow its utilization for educational and academic activities.